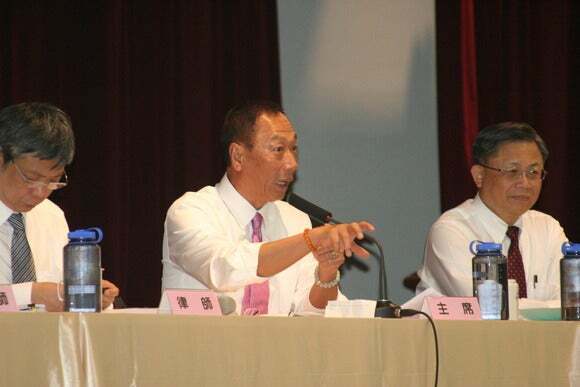 Foxconn Technology Group CEO Terry Gou mimicking a robot hand. Foxconn is the world’s largest contract electronics maker and counts Apple, Microsoft and Sony as some of its clients. Many of its largest factories are in China, where the company employs 1.2 million people, but rising worker salaries are threatening to reduce company profits. “It’s a middle to long-term goal,” Gou said. But already 20,000 robot arms and robotic tools are in use at the company’s factories. In addition, Foxconn’s CEO said the company is prepared to expand its manufacturing in the U.S., but the move will depend on “economic factors.” The company already has factories in Indianapolis and Houston, and employs thousands of workers in the country, according to Gou. The company, however, is waiting for the nation’s government to improve the regulations for its tech sector. Standards over electronics safety are so low that anyone can get away with selling shoddy mobile phones, said a Foxconn official in December.